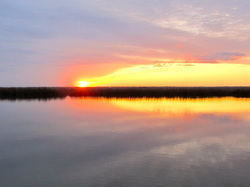 The day usually begins when the morning light comes into the hatch in the master cabin; the alarm is almost never used and that is one of the characteristics of this lifestyle. The other characteristic is not being aware of the date, which is a huge change from just several months ago where every day had commitments. Now, the notion of just keeping a calendar seems odd. 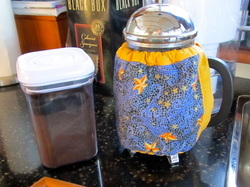 The first one up turns on the propane stove and water is filtered through the Brita to make coffee in the French press. When the cabin’s temperature is 55 degrees or under, the super effective Wabesto diesel furnace is used for about 20 minutes. Our clothing is simple and functional by using the lessons learned from traveling in Europe with Rick Steves’ Europe Through the Backdoor seminars on traveling. Seven days of clothing is only needed, as doing laundry is very easy in the marinas. Clothes are chosen for being lightweight and fast drying; therefore, no denim and only the minimum of cotton. Lightweight, zip-off pants stay clean, dry fast, and pack easily. Polyester blend socks dry quickly. Layers of polyester shirts offer the same traits. A medium weight fleece coat combined with a high-quality waterproof shell from North Face provides excellent versatility in a wide range of weather. This is the uniform of the American tourist, as most tour guides in Europe will testify. When the weather is cool, socks are worn with the sandals and the accompanying fashion statement is irrelevant. For shoes, I am quite content with closed-toe sandals by Keen and lightweight, low-top Merrill boots plus a pair of aqua-socks that are used when kayaking. Laurie has more shoes and that is another story. Appearance and hygiene standards are simpler, not lower. Cruising is not an excuse to be inconsiderate or have bad habits in these smaller personal spaces. 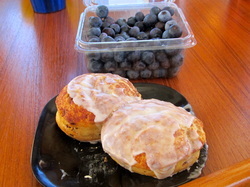 Breakfast is prepared and served with NPR broadcasting in the background as this keeps us connected to the news of the day. The cabin decks and roof are often wiped down with a microfiber towel and this has the benefits of cleaning Andiamo, inspecting the materials for signs of maintenance and the muscles get a mild stretch. The canvas or the windshield mesh is removed from the front windows and the glass gets cleaned with a squeegee, if needed. Every few weeks, another application of Rain-Ex concentrate is applied to the window and this has minimized running the windshield wipers. The options for breakfast are usually eggs, cereal or oatmeal and the choices depend upon the supplies, the variety and how warm it is. We take the time sit and eat together as this sets the tone for the rest of the day. The dishes are done together and the work is done quickly. Andiamo needs constant care and attention. The exterior, interior and the systems of propulsion, information, entertainment, water, electrical, food & beverage, and sewage can be complex and without them, the cruise can be inconvenient or worse, no happening. Most of these have a host of parts and machines for them to work. There is some daily maintenance but these needs are monitored for signals of impeding issues. Small spaces get messy and dirty quickly. If it is a travel day, the engine room will be inspected, and the oil and coolant levels are checked while Laurie readies the cabin for travel. Both of us take responsibility for turning off the propane and the water pressure whenever these are used. The engine is started and the navigation systems come to life while Laurie readies the lines to be dropped or the anchor to come up. The decisions for the day were made the evening before. Nearly all decisions regarding destinations and activities are done by consensus with the phrase, “I’m not feeling it” used to reject an idea. Planning is normally done for one to three days ahead with the wider vision of 1 to 2 weeks out discussed but never scheduled. Veteran cruisers agree that being on a schedule is a sure-fire way to create avoidable risks such as pushing your limits or going out in bad weather to stay on schedule. 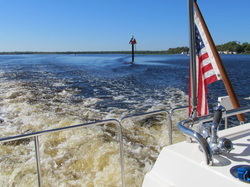 If you want to schedule a boating adventure, use a cruise line and let the professionals take the risks while you relax. Heading out, Andiamo’s engine is run at 1200-1600 RPM’s until the coolant thermostat begins to open at 190 degrees. Then, the tug is brought up to the normal cruising speed of 1800-1950 RPM’s which loads the engine at 50-55%, fuel is used at 1.8-2.2 gallons per hour and the resulting miles per gallon is about 4.0. The autopilot is a wonderful tool and used frequently but in short time periods. Rarely, we have used the auto-navigation with waypoints and those were on wide and open bodies of water without markers or chart lines; sometimes, cruising and automation are not compatible themes. Most days and in the first half of the day’s travel, the Yanmar 260 HP engine, that is made by BMW, will be brought up to its fast cruising speed of 3100-3250 RPM’s for at least 20-30 minutes to heat up the oil to eliminate moisture and other contaminants. Andiamo purrs along at 12-14 MPH, using 7 to 9 gallons per hour that results in about 1.5 miles per gallon and we cover a lot of distance really quickly. While underway, the two cups of coffee in each of the Starbucks mugs are finished and the scenery is enjoyed. 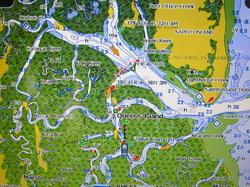 Laurie does another review of all the data in the Waterway Guides, Skipper Bob’s, The Ports Guide or the Doyle’s Guide for information on anchorages and marinas and uses the laptop to review what Active Captain.com is saying. Often, electronic charts have been downloaded to her computer. 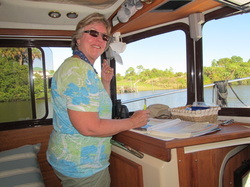 Laurie will spend at least three hours a day researching information about the coming places to see and the options for marinas, anchorage, fuel, pump-outs and provisioning. Curiosity and researching information about what is seen is how most of the day is spent. Questions are asked of Siri on the IPhone, the web is searched on either the IPhone or the laptop or the collection of guidebooks and reference material is used. Learning about a topic such as a town, a historical event, a tree or an animal is part of the joy of the journey. Weatherbug is the preferred weather app as it has a lot of information in a great format, has the current alerts and the NOAA radar. But for wind, Sailflow or Windfinder are the preferred app because it is more specific and locally, more accurate. Weather Underground is the preferred weather website on the laptop. The Garmin chartplotter has all the information needed to navigate Andiamo but we also have a Navionics app for each of our iPhones that make these into backup mini-chartplotters. Laurie has accumulated a host of guides, books and charts. 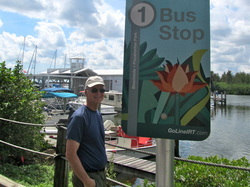 Active Captain.com is a wonderful tool to more detailed information and it includes an electronic chart. 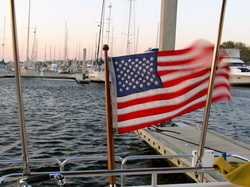 When Andiamo has been at anchor, the inverter is used while underway to charge the computers, iPhones, and the re-chargeable AA batteries that are used in the camera. Traveling over lunch is common. So, the meal is light like hard-boiled eggs and fruit or half a sandwich and fruit. Sometimes, the day is broken up and stopping at a free dock or anchoring off of the channel for lunch intentionally slows the pace down. Adjusting to the weather is a daily part of this lifestyle. Curtains and canvas are constantly handled for protection from the sun. Higher winds, like gusts over 25 knots, means checking lines, tying things down and putting the fenders that are not working up on the deck to stop them from slapping the hull. Managing for rain or spray means closing windows and hatches, keeping wet jackets in the cockpit, wiping up puddles and drying things out when the rain passes. Leaks and drips are a fact of life; after all, it is a boat. Living in small spaces means being neat, putting things away, compromising, and choreographing movement, as we cannot be in the same space at the same time. Constantly being within 10 feet of each other creates a high degree of connection but it also can cause irritability the requires more tolerance, patience and consideration. The little and petty irritants can affect the cruise. Staying in perspective to not sweat the little stuff helps keep harmony. Andiamo is our vehicle, it is our home; it is a place where work, play, rest, having solitude and being social all happening in the same space. The Sirius XM satellite radio is used a lot in the afternoon and evening for music and is interchanged with the IPod that has 1,600 music tracks in its memory. We are listening to the songlist in alphabetical order so every song is a surprise. Watching broadcast TV is more of a gift than an expectation, and many places, there is very little reception. What we cannot watch on the TV is often streamed to the laptop when there is a good Wi-Fi connection, which happens frequently. We use the tug’s head and shower almost exclusively, rarely using a marina’s facilities because the tug’s facilities are well made, easy to use, and convenient. We have adjusted to taking showers in the afternoon because the days are often hot and sleep comes easier and if anchoring, the engine has created a full tank of hot water that will slowly cool. One side benefit of using the tug’s shower is that the head gets a thorough cleaning frequently. The holding tank is pumped out between 5 and 7 days and it has never been full. The availability of water is so high that we do not conserve it and have no anxiety about topping off the tank every few days.. When lunch is the heavy meal, dinner is a very light one. Beer or wine is our cocktail of choice and frequently is served in the cockpit, even when dinner is out to save the expense. In the average week, having dinner out happens about twice because we eat better and the portions are better on the tug. The money saved in eating is used for museum admissions and bookstores. Like at breakfast, the dinner dishes are done together and the whole cleaning process may take 10 minutes. If the network TV news is available, we will watch it. The IPhones have a TV guide app that tells us which stations are playing what programs.